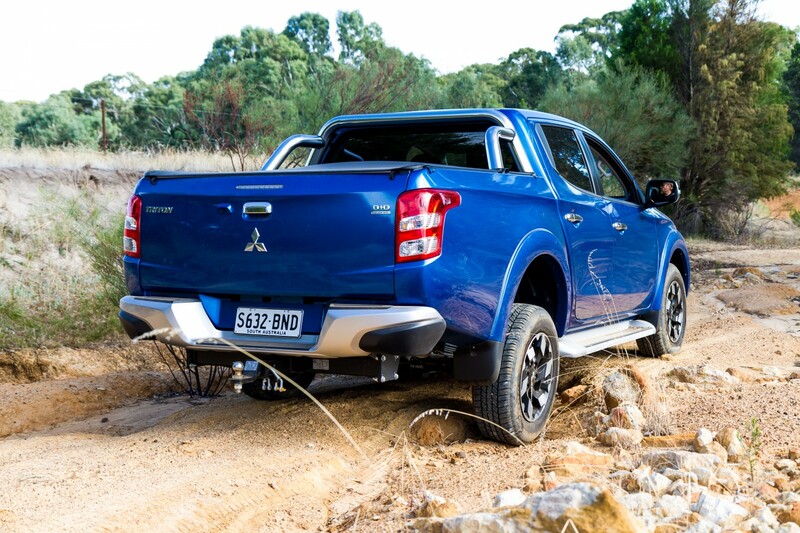 I Really Am Saying This… Triton Is A Seriously Improved Ute! I’ve heard it said a million times before in ute circles by the one-brand blinkered brigade that anything other than a Toyota or Ford is crap. It’s easy to say that when you haven’t driven other makers’ products and over the years I’ve been teaching, I’ve taken an interest in observing what they do when they’re in the classroom, so I’ve got an informed idea rather than none. In the classroom you can measure performance, compare suspension articulation, traction electronics and more in an almost scientific way, where opinion means little and observation is King. There have been plenty of surprises and this is another. 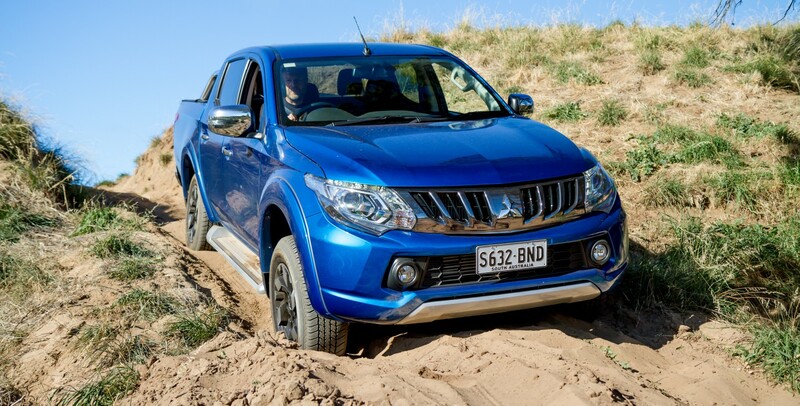 Whilst Mitsubishi has made one of the best 4WD wagons for donkeys-years in the form of the Pajero, the Triton had been left languishing as an also-ran ute, the preserve of Government and utilities wanting a purely cheap fleet. That’s no longer the case as the current Triton is bristling with features and capability that make it a much better vehicle and importantly, better than a number of others in this highly competitive class. 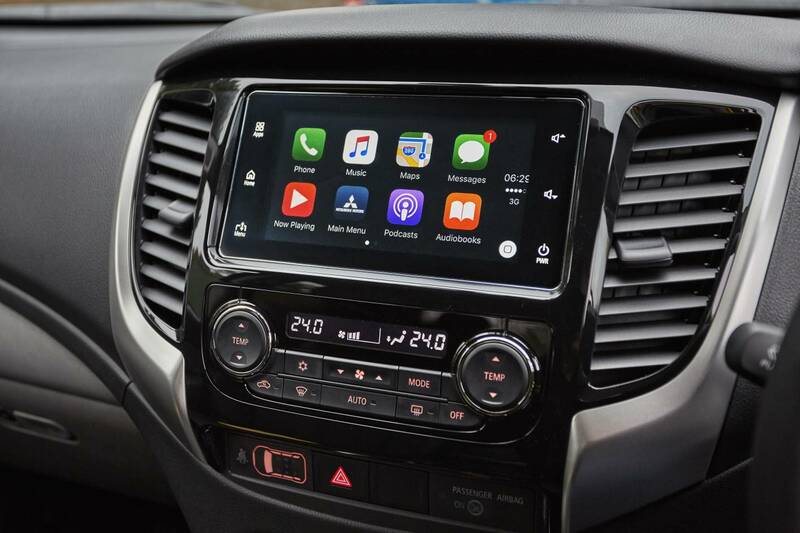 The blue Exceed we tested in recent weeks had just about every conceivable gadget known to mankind and even Apple CarPlay… This pains me greatly as I wanted desperately to dislike its gadgets, as the Luddite in me frowns upon gizmo excess in a 4WD, but here we go, Apple CarPlay in a 4WD is genius! But that’s just one of many aces up the Triton’s sleeve pitched against surprisingly few negatives. I’ll start with the important stuff, the driveline. 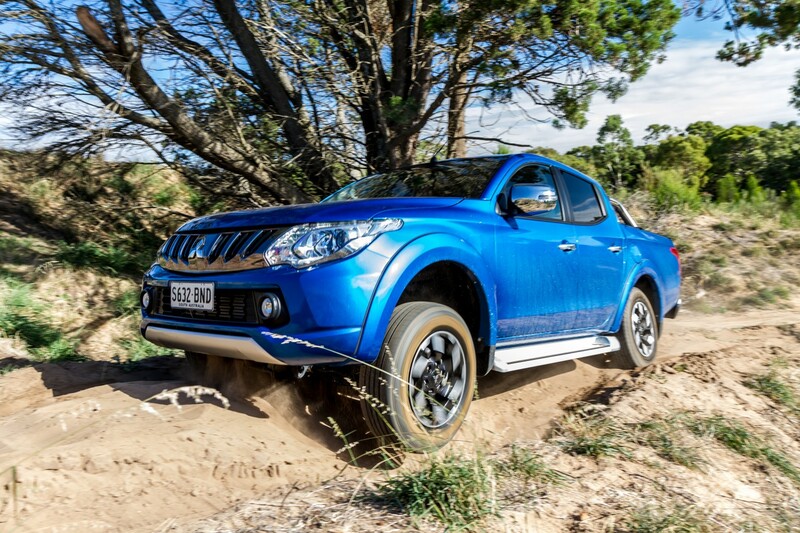 The 2.4 litre diesel in the Triton is an extremely honest engine, with middle-ground outputs of 135kW and 430Nm. And that’s a freckle more than new Hilux. It drove at a keen pace both around town and on the highway and even with our test load trailer didn’t baulk at hills, so it’s got enough grunt. The 5-speed auto in our tester had a good spread of gears and coupled to its sports-shift semi-automatic mode it had me once more lamenting the seemingly inevitable passing of the manual gearbox. The paddles on the steering column were a welcome addition to the gear selection duties and importantly keep hands on the steering wheel when you’re concentrating on the road ahead. Someone told me the auto is the same Aisin unit seen in the Pajero for ages and used by Toyota in the old 100 series Land Cruiser and also Isuzu in DMAX and MUX prior to the six-speeder they’re using now. 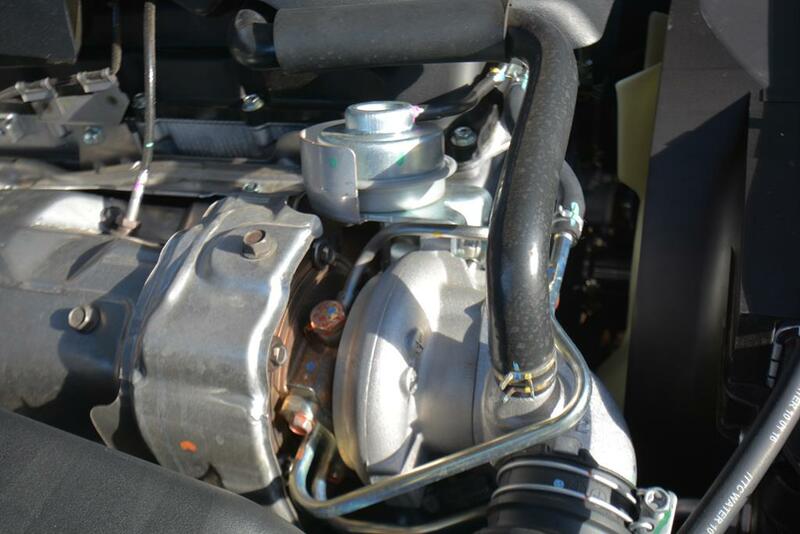 To meet increasingly more stringent pollution regulations, Triton has been equipped with a DPF (diesel particulate filter) and sets its turbocharger up high in the engine bay to leave enough room for the DPF sited below the exhaust manifold and high-enough not to start any fires. The same method has been trotted out by Isuzu with its recently released “Pumped-Up” 3.0 litre motor (and that’s another one we’ll have our time in soon). That’s the DPF tucked in behind the turbo. Up nice and high in the engine bay. Now DPF’s can be a problem-child if you potter around at a snail’s-pace and then don’t give the car a good flogging once-in-a-while. A monthly blast at or around highway speeds for 15 minutes or so will generate enough heat when coupled to a squirt of fuel injected into the exhaust (another trick employed to speed the process), to burn up the crud and set you up for the next month’s motoring without issue. Neglect that and a trip to the dealership will likely be on the cards for a bit of an expensive chimney sweep. It’s a little annoying but every maker will be using this method or the Urea alternative (Ad-Blue) to keep the Nitrogen Oxide levels at a minimum. Ad-Blue isn’t without its own challenges as the fluid is sensitive to heat, doesn’t store for long and is extremely corrosive to certain metals. You’ll see that on European vehicles and if you’re thinking what I’m thinking, it sounds more expensive in terms of operational costs. The thing that makes Mitsubishi 4WDs different is Super-Select. Base models get the simpler Easy Select, a part-time 4WD transmission, but mid-upper models get the real deal as Super-Select has both part-time and full-time options. Since 1991 Super-Select has been the mainstay of the Pajero 4WD driveline and in my humble opinion is still the best 4WD trans out there. Whilst the earlier versions were a mechanical/electronic combo in their activation, the new ones are a dial type electronic activation in the modern idiom. 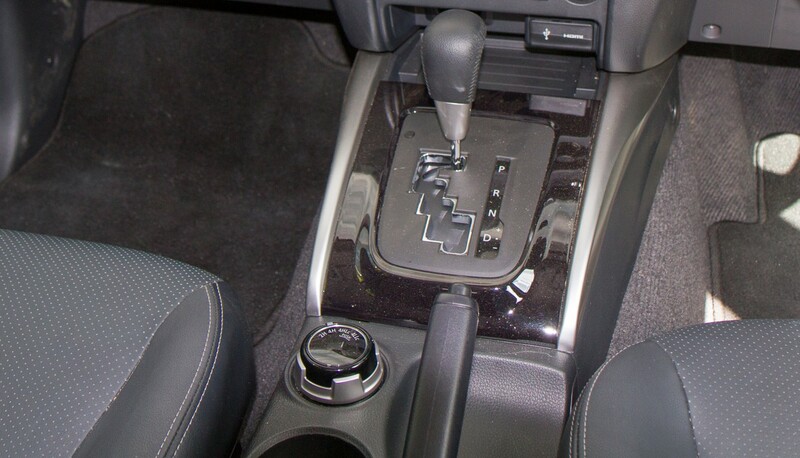 This transmission style has been used before with both Nissan in the Pathfinder and Jeep in Grand Cherokees. The arrangement in the Grand Cherokee was dumb, locating the full-time mode after the part-time 4WD mode. That was illogical, as the Mitsubishi system shows. Rotary dial drive mode selector. One of many Land Rover copies! Around town on dry bitumen you can run it in 2WD and save a few bob on fuel used and enjoy lighter steering for the car park duties. When the heavens open up or if the bitumen is crap or curvy, shift into 4H, the constant 4WD or AWD mode and enjoy seriously enhanced grip, the sort of grip Subaru’s been crowing on about for donkey’s years and made it a rally success. That same 4H mode can be useful on high-speed dirt too, providing sure-footed cornering, braking and reduced tyre wear. When the dirt road starts to disintegrate with corrugations the norm or when the sand emerges and you might find yourself on a hard beach stir the pot again and select 4HLc. This one engages the centre diff-lock and is the part-time mode for loose surfaces only, not bitumen, concrete or paving. 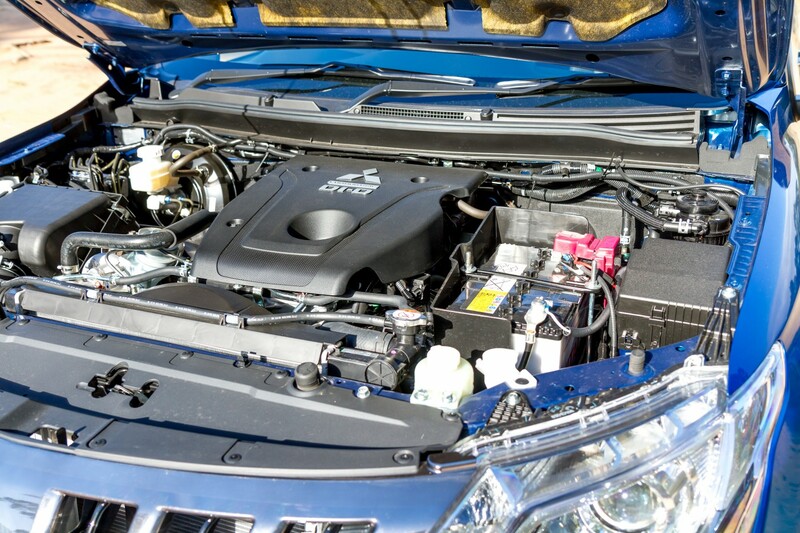 That is the point of difference compared to the Jeep, as the track space changes the Mitsubishi system logically steps up the capability and saves the risk of a wound-up transmission. Going from 2WD to part-time 4WD, with AWD following that caught plenty of people out in the Grand Cherokees when they thought they were doing the right thing on a wet bitumen road, only to have a busted transmission and a very expensive repair. Simple and clear instruments with an excellent drive mode indicator that confirms selection of the various drive types available. In the Super-Select all of the high range modes (2WD/4H/4HLc) can be engaged at speeds up to 100km/h (although I’d don’t recommend 100 on the dirt because that’s when the rollovers start to occur). As with any low range engagement you’ll need to bring the vehicle to a complete halt, so 4LLc (4WD low range, centre diff-lock) is a low speed, high-torque mode designed for climbing steep hills or dealing with the boggy stuff. Low range on our Triton was decently deep at 2.566 with commendable engine-braking and no scary moments on steep descents. The other bit of genius with Super Select is a dashboard display that I model my classroom explanations of the 4WD driveline on. Slap-bang in the middle of the gauges is an easily understood indicator that adds elements as you change the modes, green is good on bitumen, amber is for the dirt. If it’s flashing you’ve bumbled something, it’s simple. 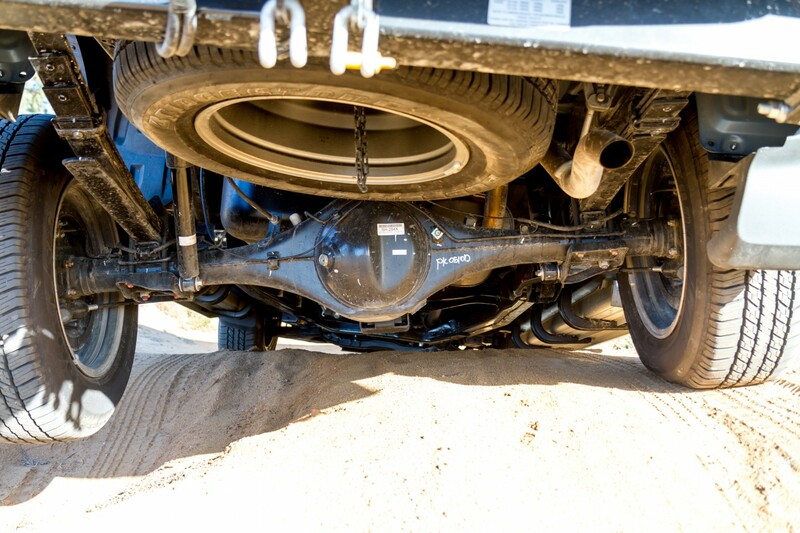 Now to enhance the 4WD ability our test Exceed also offered a rear axle diff-lock. 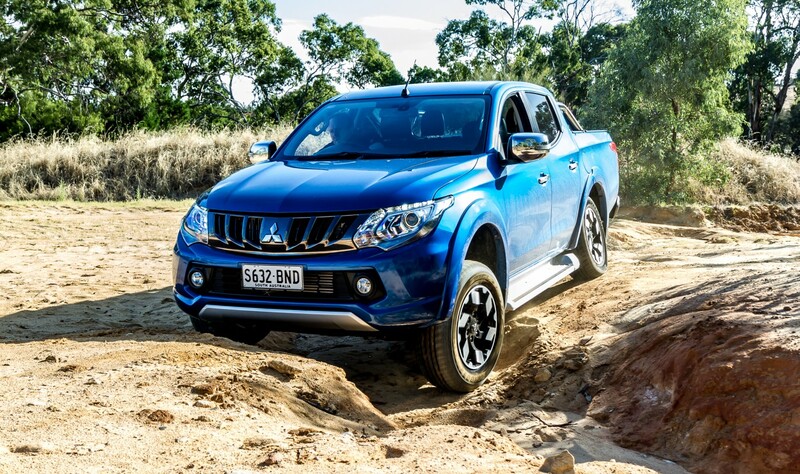 Bravo Mitsubishi offering that in its Triton range and bah-humbug manufacturers who don’t! A rear diff-lock joins the axles as one, disabling the essential differential action required for getting around corners and the undoer (I made that word up) of many a great day 4WDing when a wheel goes light, spins and digs a bloody big hole with the inevitable bog result. With the rear diff-lock engaged that unwanted wheelspin won’t occur and you’ll keep moving. The only downside to rear diff-lock engagement is traction control is disabled, so whilst we’ve just fixed the back end of the car, the front end can now freewheel. 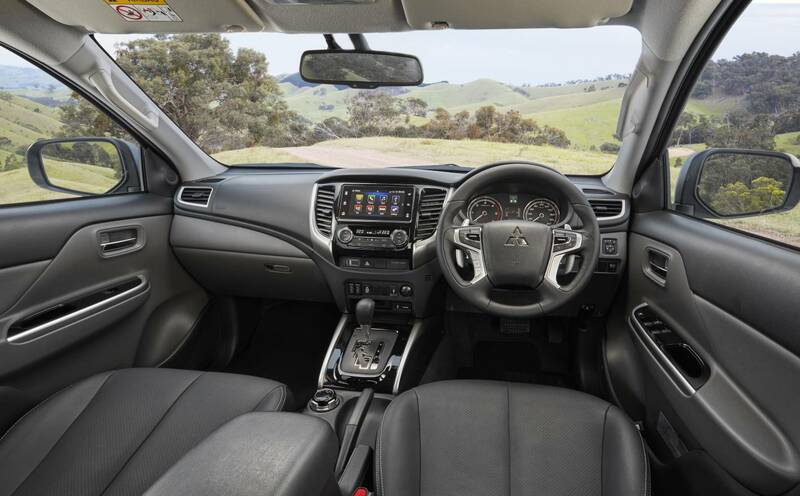 Mitsubishi aren’t alone in this, as I’ve driven other utes and wagons that do the same. Odd given you want the best chance of getting across that section of track with the best grip, but now the front wheels aren’t helping the cause much? That’s a shame because Triton, like new Hilux, borrows simply brilliant traction electronics now from their respective wagon siblings. Instead of in previous generations having to rev the ring out of them to get some traction braking applied with a likelihood of broken CVs if pushed too hard, now any hint of slip is dealt with in a snip and forward progress maintained with little to no hesitation. You’ll still want to turn it off though on any extended sand or mud adventure, but on the firmer stuff it works especially well. Rear diff and that dampener hung off the front of it were easy to plough into the ground. Biggest issue for Triton off-road is its lack of ground clearance. You’ll need bigger and better tyres to fix that. 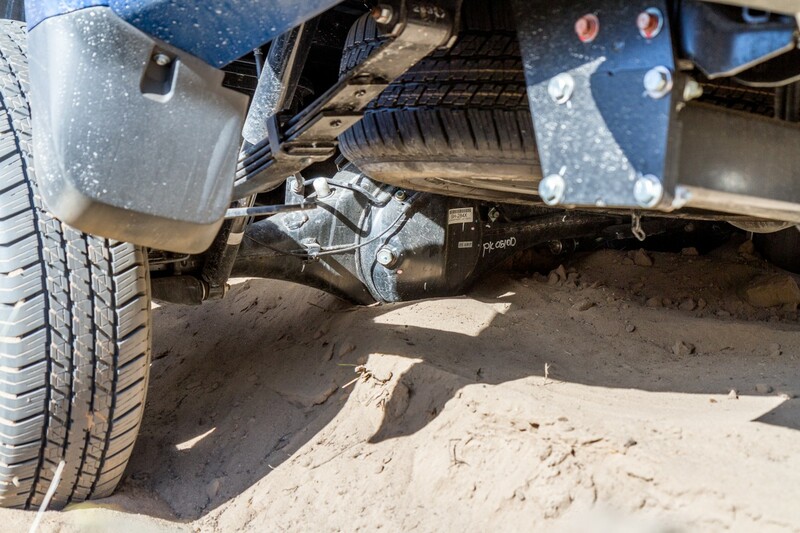 Something else that does inhibit the Triton’s off-road ability is clearance. Stock standard there’s only 205mm, about the same as the previous generation Hilux and they were pathetic, so if you venture onto a high-crowned track you’ll get hung up. The other important note here is the dampener sited ahead of the rear differential housing. It’s a solid lump that sits at around the same height as the diff but it acts like a yawning mouth ready to catch sand, mud, rock and bring proceedings to a halt. Its job is to smooth out vibrations in the tail-shaft as it’s a biggie and two-piece, but its placement isn’t conducive to good off-roading. We got caught out pretty early in the piece when it acted like a grader blade in the sand and halted our progress. Not sure what the effect might be of removing it, I suspect not a lot of difference in the vibration-stakes, whilst the benefits are potentially huge in the off-road stakes. It’ll uncouple easily, the bracket that supports the mass block has two bolts installed either side of the diff housing (have a read at the end of this review on what it’s there for). Whilst we’re talking diffs I also noted that the rear breather doesn’t have a hose attached to it, instead a white nylon cap covers the essential spout and that calls into question its efficacy in preventing water ingress if you took the Triton for a splash in a stream. It’s easily fixed as ARB makes a diff breather kit that’ll route hoses from the front and the back to a higher point under the bonnet and terminates at a simple manifold with air filters seen on their compressors. You’ll need to drop the front bash-plate to get access to the front diff to install the hose. I noticed too that Mitsubishi also offer a bash-plate kit to cover the transmission in their accessory lines. 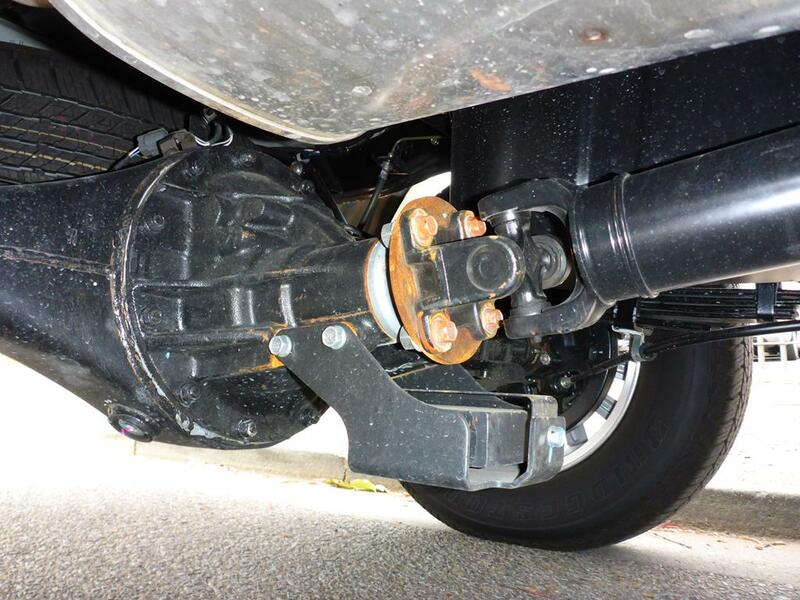 That might be one of those items you try and get chucked into the deal you strike with the salesperson along with a towbar, as it’s pretty essential to protect the gear-gubbins under the truck in the middle. The wheel package on Triton is too small and it’s a size that’s an oddity and you’ll find impossible to source out in the backblocks. The diameter of the stock 245/65R17 is only 750mm (and it’s a passenger car tyre), whereas a readily available (light-truck) LT265/65R17 would be 775mm. Now that increase doesn’t seem much but I can tell you that going from 205mm to 218mm makes a big improvement on a beach and elsewhere. If you were looking to maximise the permissible increases our Road Transport wallahs now make available to us and change the suspension and go up a tyre size again to an LT265/70R17, you’ll arrive at 802mm with now a much better 231mm clearance and I’d wager an accurate speedo too. Another thing you might want to park-up are the wheels. The flat face of the alloys will get bruised and easily as they are exposed with no dish on the outward face. The clear-coat covering the polished face on one of our wheels didn’t appreciate a light contact with a piece of sandstone, leaving an unsightly scuff mark. Leave the 245s in the garage for the day in a couple of years-time you sell the Triton and in the meantime invest in some nice CSA Alloys fitted up with some Toyo OPAT2s of the right size. Visually and off-road it’ll be a heaps better truck. Hmm…those shocks aren’t going to last long are they! The stock suspension on Triton I think offers one of the best standard “tunes” I’ve driven in recent times as its firm. So many utes I get into are soft with mismatched front and rear ends that understeer like pigs and get unsettled really easily with corrugations or undulating surfaces and crash to their bump-stops. The rally experience that Mitsubishi brings to their products is obvious here and I like it, however I doubt it’ll be long-lasting as the shockers are tiny and stock springs aren’t renowned for their longevity. Clearly in a short amount of time it’ll be a trip down to ARB for a complete front and rear change-out and the difference will be transforming and durable. This is especially important if you tow, for whilst our test load of alloy tandem trailer with a Yamaha ATV equipped with spray kit and mower was modest at around 1800kgs and the stock suspension barely flinched, over time it’ll suffer and sag and become very reactive to anything less than a perfect road surface. I had a client visit just this week with a now two year old Triton with 50,000kms on the clock and it was obvious the rear springs were tired as its bum was hanging low. Remember on my last ute test of the new Hilux I wasn’t happy with its “Moose” ability? At 80km/h I did a simple swerve and recover and it took ages for the stability control to react with three big steering inputs, potentially putting you into the weeds if a skippy (or moose) jumped out in front of you. Not so with the Triton. At the first hint of the inevitable oversteer the motor decelerated and brakes were applied remotely by the stability-control Gods and control was brought back to my grasp. Mitsubishi have also added a trailer sway assist too that’ll help when you punch through the wake of a B-Double and things get sketchy. That’s good! Being 220mm shorter in the chassis than a Ranger creates some visual travesties and some compromises. The tub length is set all behind the rear axle and the balance aesthetically is horrid when viewed side on. It’s nearly 300mm shorter and nearly 100mm narrower and marginally shallower, so the volume of material that can be hauled isn’t nearly as good (that might be a good thing to avoid being called in to assist with a house move). The maximum tow weight is short at 3,100kgs and so too the combination mass at 5,885kgs when you compare it to the others (typically at a 3,500/6,000kgs combo). The stated towball downforce maxed out at 310kgs (co-incidentally matching the maximum tow weight), a typical 10% measure of the load hooked on the back. Inside the cabin is a comfy place, the seats were good for my bum even after an extended drive with side bolsters that locate the hips well. I can do without electric seat activation though, they’re too slow and one day the motor will fail. The cabin is narrow and a couple of big boofheads in the front gets shoulders close, whilst rear seat passengers will be squeezy if you intend carrying three. Legroom was OK though. The dash had all the usual suspects and the previously mentioned Apple CarPlay. The touch screen is a 7” size with nice and big icons (good for old eyes) and synchs up with smartphones quickly. I also loved being able to listen to DAB channels on top of the usual bland FM ones and allowed me to tune into the ABC news on the AM band too. The speaker system was of a decent quality and fairly belted songs out. So with AM/FM/DAB/CD/MP3 and accepting hook-up via USB and HDMI it’s got just about every audio acronym known to mankind. The air conditioning unit was frosty cold for me and mild for the boss on a couple of warmer days, being a dual-zone style and easily adjusted around the cabin. It quickly defrosted the screen one morning so that’ll be helpful in the depths of winter and the mirrors fold in when the car’s parked up, which’ll save the carpark bastards breaking them. Yes it’s even got a stupid push-button ignition for those who must have that trendoid (another David-word) new vehicle statement. Now styling is a topic that’s very subjective, one man’s treasure is another man’s trash, so I won’t dwell on this but the face of the Triton is err… busy. Side on and there’s a lot of folds and the previously mentioned tub imbalance, whilst the tail is OK. If it had been smoothed over and made less fussy Mitsubishi would sell heaps more of them here, but I suppose in other markets the look appeals. So, time to trot out a verdict. You can’t beat the price-point on this vehicle as the value is extraordinary with the fruit that’s been poured into it. 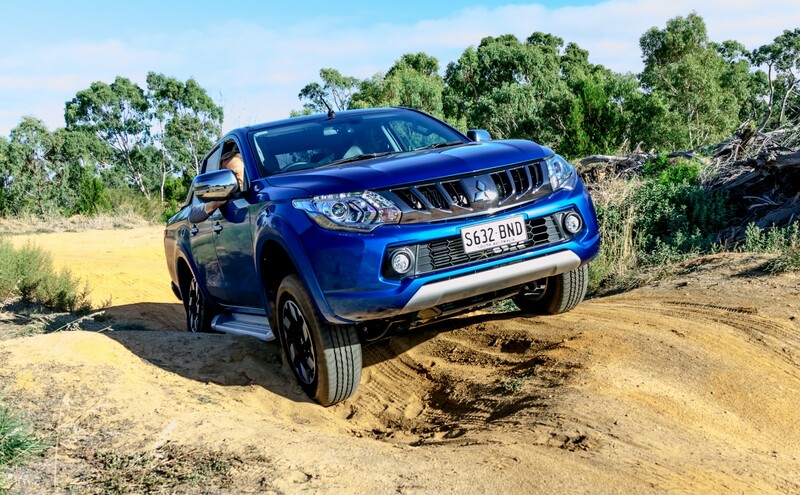 Even assuming its resale in three years-time will be worse than say Hilux or Ranger, it’ll still have saved you $10,000+ in initial purchase and therefore lease costs, money that could be put to tyres and suspension with enough change for fuel for a really big trip. The warranty is excellent with five years/100,000kms coverage, capped servicing charges and the usual roadside assistance offer. 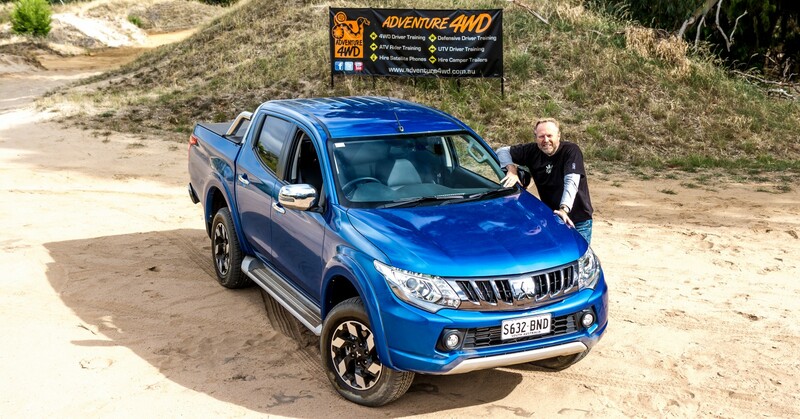 It stops well, it steers well, it’s comfortable, it’s got all the gadgets, the off-road potential is very good with one of the best traction control systems out there in a ute plus a diff-lock and Super-Select is the best 4WD transmission. Here’s my moment of reflection though and amongst Triton’s list of precious-few negatives, the biggie for me is that the clearance lets it down off-road. Use that $10,000 saving on the purchase price and fix the obvious and you’ll have a very capable and functional ute. Oh and don’t even think about buying the genuine Mitsubishi fancy canopy unless you are a contortionist! The windows are ridiculously small and the styling is hideous, the design costing valuable volume for carrying loads. Their tradie canopy is much better. Likewise steer a wide berth away from their nudge bars and bullbars, neither offer anything stylistically nor in function with an approach angle and access that’s likely worse than the stock plastic bumper. The Triton should be on your shopping list because it will surprise you and I wouldn’t mind betting if you don’t need a big vehicle then this will suit you perfectly. Take one for a drive and see if you agree with me? The rear diff dampener (the official term is “tuned mass dampener”) seen on Triton is there because the tail-shaft is long and in two parts. From the back end of the transmission it runs to a midway tube cross-member, fixed in the horizontal plane where it joins with the rear half. That join is supported by a rubber insulated carrier where a universal-joint allows the back half of the tail-shaft to articulate in the vertical plane as the rear suspension rises and falls. As it does that the angles of the universal-joints at each end of this last piece of the puzzle will change and load up, potentially creating a vibration that could buzz through the car. The dampener block is acting like a sprung lever, in this case hanging off a bracket that reacts to any vibes by cancelling out the harmonic created by the changing angle, absorbing the vibe before it becomes obvious. It’s a bit like watching a tuning fork at work, once activated and buzzing bring it into contact with an opposing force and it cancels out the vibration. Changing the suspension could be trickier than I first imagined as longer rear springs will increase the angle that the rear tail-shaft piece travels through, putting extra load on the two universal-joints. Traditionally to overcome that problem you’d drop the centre carrier to flatten out the angles a bit and get them running in a straighter line. I can’t see a quick way to do that as the carrier is supported atop the cross-member rather than underneath it. I’m sure the aftermarket community have a solution and I’d invite you to let us know what your fix may have been. Got an MQ Triton Exceed? Tell us what you think of it. 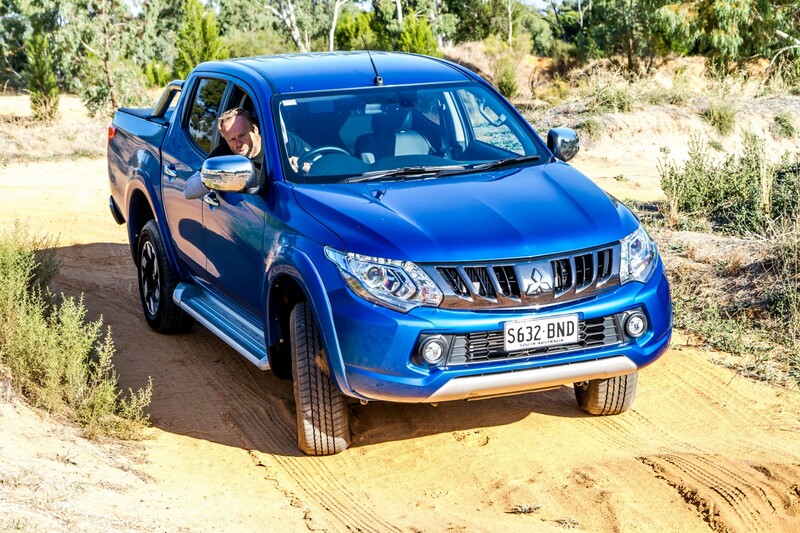 Triton Exceed (auto): $46,580 on-road in South Australia at time of writing.